Turn a great day into an unforgettable day with a visit to one of these amazing ice cream shops in The City by the Bay. San Francisco summers are typically blanketed in fog, so ice cream serves a completely different purpose here than it does in sweatier cities. 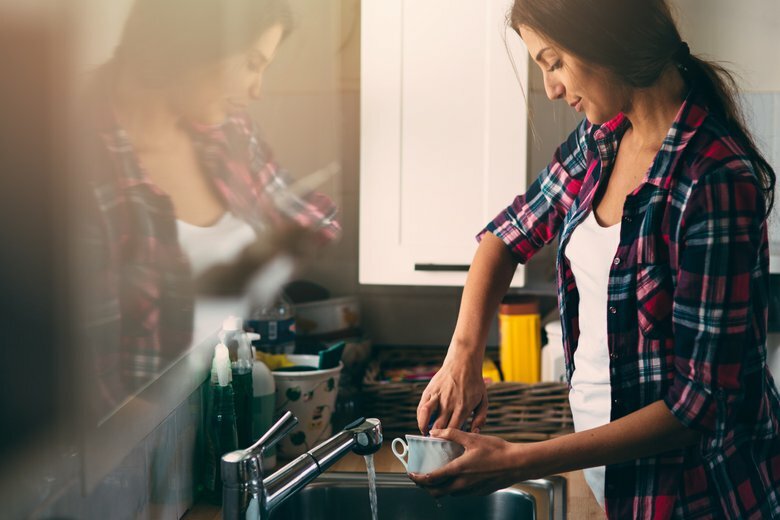 For us, ice cream isn’t a necessity for cooling off on a hot day -- instead, it’s a delicious treat that we use to celebrate occasions, both big and small. Case in point: After tirelessly washing away cobwebs from the bay windows in my old San Francisco apartment, I decided to treat myself. I zipped up my sweatshirt, put on socks under my sandals, and celebrated clean windows by eating a scoop of salted caramel ice cream (indoors). 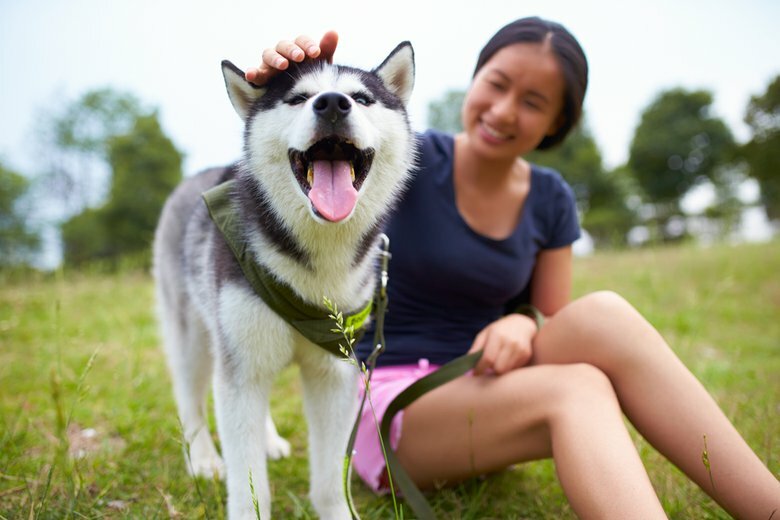 So, whether it's because you finally cleaned the house, your children earned awesome grades in math or history, they got a glowing report from the nanny, or they finally listened when you demanded, “Put the iPhone down,” going out for a scoop of ice cream is a fun way to celebrate any achievement. 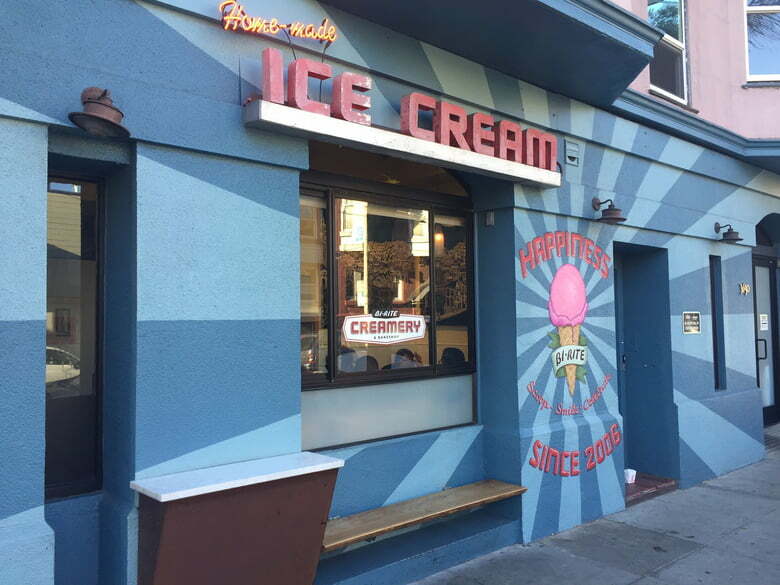 Here are 10 ice cream joints in San Francisco that are great places to go for a celebratory scoop with the family. Hours: Sunday - Thursday, noon - 10 p.m. | Friday & Saturday, noon - 11 p.m. Step into the Ice Cream Bar and you’ll wonder if you’ve traveled back in time. You’ll be greeted by very friendly staff dressed in all white, with black bowties and little paper hats atop their slicked-back hair. The staff call themselves soda jerks, a term reminiscent of the 1930s soda fountain movement. The Ice Cream Bar is shiny, with marble counters, stools, and unique-looking tools that are used for making all types of ice cream delights. Kids can choose from dozens of flavors to that they can turn into milkshakes, malts, sundaes, or scoops toppled on homemade cones. Parents can even treat themselves to a boozy treat, shaken with sorbet or ice cream. Don’t let their old school approach fool you, though: Many of the flavors are new school. People love the Ice Cream Bar’s vegan options, as well as their unique flavors like banana pudding and caramel popcorn. My personal favorite is the “Olive Oil,” which has weirdly inspired me to dribble a teaspoon of olive oil on my vanilla ice cream at home. Hours: Monday - Thursday, noon - 9:30 p.m. | Friday & Saturday, 11 a.m. - 10 p.m. | Sunday, 11 a.m. - 9:30 p.m.
Polly Ann Ice Cream is always packed with kids minutes after the school bell rings. It’s the most popular place in San Francisco to get a yummy treat after school, no matter how foggy or chilly the Sunset neighborhood gets. There are a couple of things that make this ice cream shop really special. First, there’s the “Wheel of Fortune.” It’s pretty self-explanatory: You can spin the wheel and let fate choose your ice cream flavor for the day. The wheel is extremely popular because there are just too many ice cream flavors for patrons to choose from -- 48 to be exact! The wide variety of ice cream flavors is the second reason why Polly Ann’s is tops. Some of the most popular unconventional flavors include green tea, lychee, jasmine, and durian. If you have a picky ice cream eater, don’t fret. Polly Ann’s has just as many classic flavors as exotic ones. 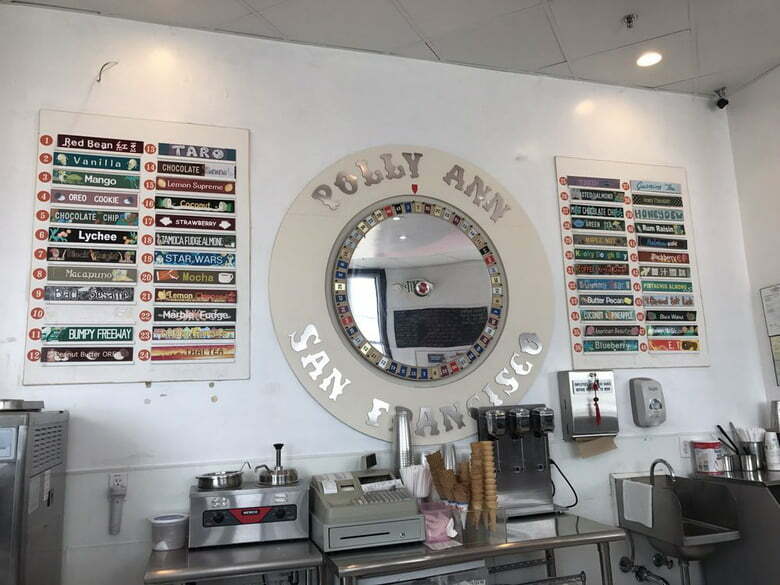 Mission District: Open daily, 11 a.m. - 10 p.m.
Alamo Square: Open daily, 9 a.m. - 9 p.m.
For families who flock to the epic playground in San Francisco’s Dolores Park, this is your designated ice cream destination. Take a break from playtime with a creamy treat to enjoy in the sunshine. But, be prepared to stand while you eat because it’s not likely that you’ll find a place to sit in this bustling ice cream joint. Choose from heavenly flavors like roasted banana, honey lavender, balsamic strawberry, and the uber-popular salted caramel. The “trifecta” trio is a real crowd-pleaser, too: It has scoops of salted caramel, brown sugar with ginger caramel swirl, and malted vanilla with peanut brittle and chocolate. Keep in mind that the line for Bi-Rite Creamery usually wraps around half the block. If you’re in a hurry, you can always pop down the block to the Bi-Rite grocery store, grab their ice cream by the pint, take it back to the park, and finish it as a great family bonding activity. Another option to avoid the long line is to opt for their soft serve ice cream, which you can access by walking up to the window next door to the shop. There, you can choose from two delicious flavors: vanilla or salted caramel. Oh, and don’t forget to top off that soft serve cone with sprinkles! 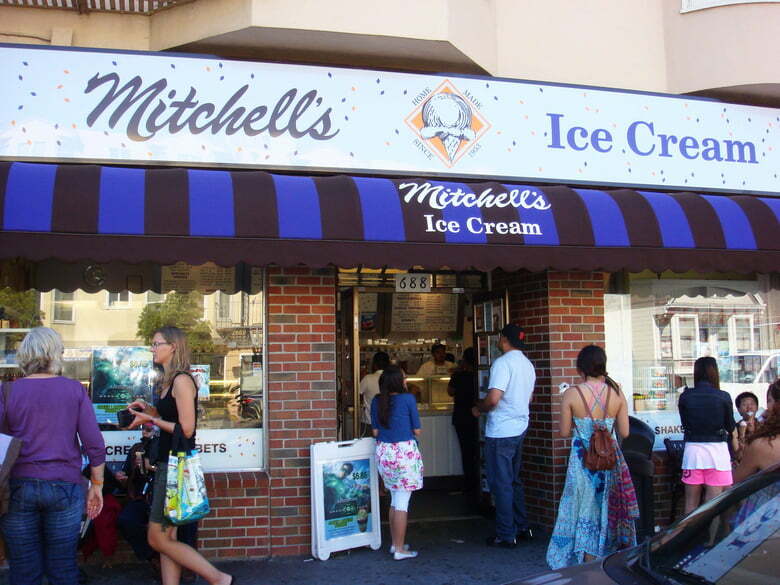 Hours: Open daily, 11 a.m. -11 p.m.
Mitchell’s Ice Cream captures the very essence of San Francisco, and boasts a lineup of over 40 flavors that celebrate the city’s rich cultural history. example, you can find flavors based on Filipino desserts like halo-halo, which is made up of buko, langka, ube, pineapple, mongo beans, sweet beans, and kaong (palm fruit). You can also enjoy flavors inspired by Irish, Mexican, South American, Indonesian, and Chinese ingredients, too. So, no matter whether your family’s from San Francisco or not, Mitchell’s always has flavors that will make you feel like you’re home. 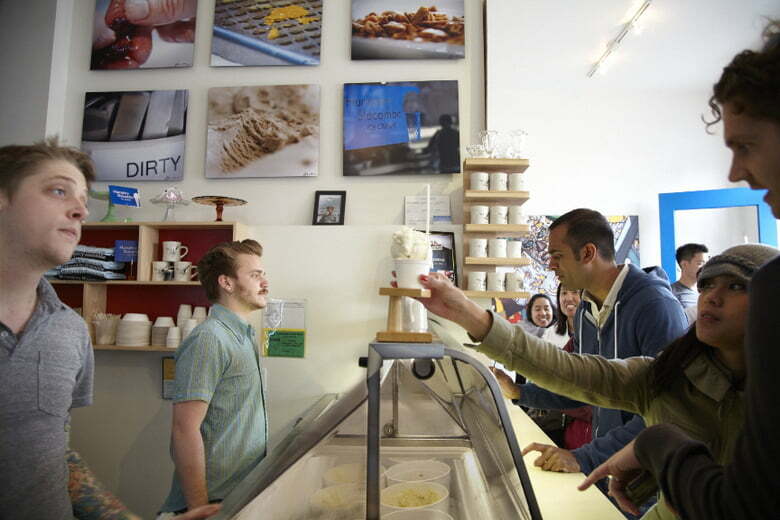 Like many other ice cream shops in San Francisco, there’s typically a wait before you can select your scoop. But Mitchell’s has adopted the classic meat market queue. Patrons pull a number from the number dispenser and wait for their number to be called by a scooper. I typically use the wait time to decide which flavor to order. It’s always a toss up between Mexican chocolate and pistachio (of course, I end up getting both). However, their seasonal pumpkin flavor always takes precedence when it’s available. Mission District: Monday - Thursday, 1 p.m. -1 1 p.m. | Friday & Saturday, 12 p.m. - 12 a.m. | Sunday, 12 p.m. - 11 p.m. Ferry Building: Sunday - Friday, 11 a.m. - 9:30 p.m. | Saturday, 8 a.m. - 9:30 p.m. The thing I love about Humphry’s is the shop’s simplicity and the ice cream’s complexity. I lived blocks away from its Harrison Street location, and it truly felt like my neighborhood spot. This shop has a handful of outdoor tables, where I’d often run into my friends from the neighborhood and chat with them for a while. Inside you’ll find a couple of stools and a staff of local youth jamming to tunes by Beyonce or Morrisey. Unless there’s a heat wave, the wait at the Harrison Street location is shorter than its sister location in the Ferry Building. It’s fun to stand and listen to everyone in line discussing which flavors they’ve tasted before, as well as debating which flavors they plan to taste today. Every week on my walk home from dance class, I’d stop at Humphry’s five minutes before closing time to pick up a pint of the “Blue Bottle Vietnamese Coffee” flavor. I felt I deserved an ice cream treat after pop, locking, and dropping it for an hour. Hours: Sunday - Wednesday, 12 p.m. - 10 p.m. | Thursday - Saturday, 12 p.m. - 11 p.m. Going to the Smitten flagship store isn’t just an ice cream outing, it’s an experience. Duck inside a recycled shipping container and discover little clouds of what looks like smoke puffing out of a contraption similar to a baking mixer. Usually when kids see these machines, their eyes widen and they begin to ask a lot of questions. “What are those machines? Are they hot? Why are they smoking? Isn’t ice cream supposed to be cold?” These are all valid questions that the Smitten team is ready to answer. Parents can sit back and enjoy a science lesson in ice cream. Unlike most ice cream shops, Smitten Ice Cream churns ice cream as it’s ordered. It’s a similar model to our beloved pour-over coffee, except the technology is a lot cooler. (Pun intended.) 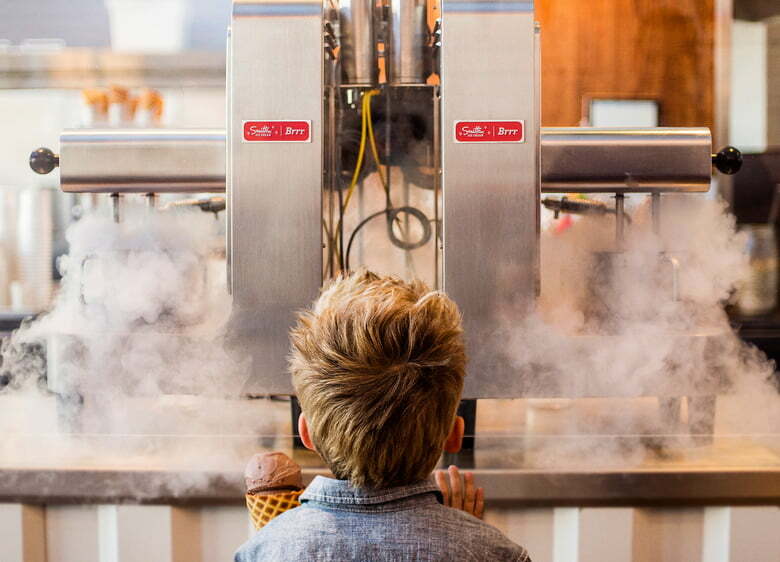 Every Smitten ice cream shop is equipped with tiny ice cream churns that use liquid nitrogen - hence that mysterious puff of fog rising out of the churns. Ice cream made with fog? This is truly a San Franciscan ice cream shop. Additionally, all the ice cream is made with local cream, sugar, and fresh ingredients. So, if you order a scoop of mint chocolate, you’ll see your “Brrrista” drop some freshly squeezed oil from real mint leaves into the ice cream machine. Lavender ice cream has flowers in it, the Earl Grey flavor is created with black tea leaves, and coconut ice cream has bits of coconut macaroons! Hours: Monday - Thursday, 2 p.m. - 12 a.m. | Friday & Saturday, 1 p.m. - 1 a.m. In a town where you can pay $7 to $10 for a scoop or two, it’s nice to have the recent addition of the CREAM ice cream shop. For less than $5, you can build an ice cream sandwich customized to your liking. You can even choose the type of cookie, type of ice cream, and type of toppings that you want. This is the ideal destination for an ice cream explorer. With oodles of options, there’s a possibility that you could visit CREAM every day for a month and still not have tried everything. There’s also a high possibility of going overboard with your order, so I suggest going in with a plan. Stick to a flavor palette. One day, I’ll choose white chocolate macadamia nut cookies, coconut ice cream, and almonds as my topping. Other popular combinations include toppings like Nutella, gummy bears, fruity pebbles, and sprinkles. 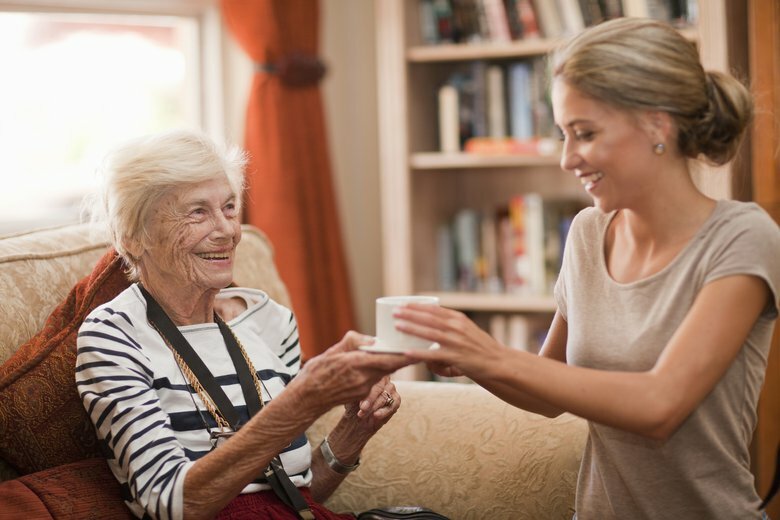 If you’re overwhelmed, ask for a recommendation. 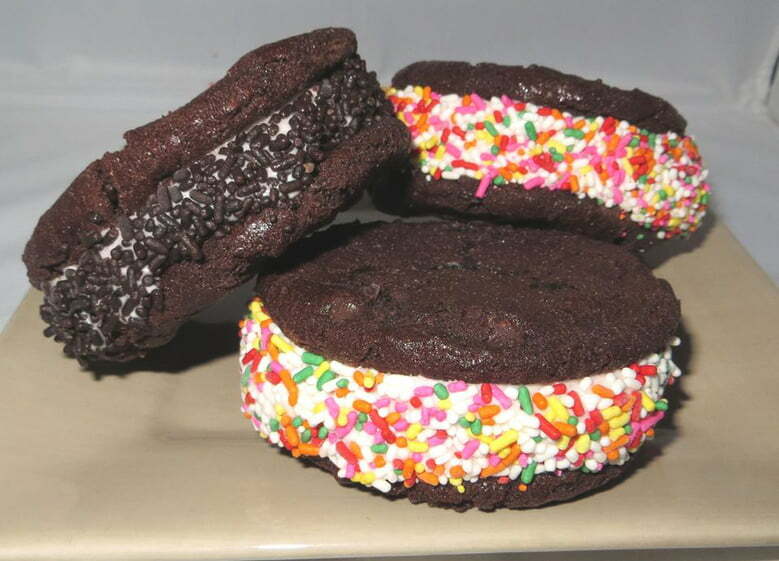 The CREAM staff are experts in crafting a tasty ice cream sandwich. Beware, it’s impossible to park near the Mission location. Lucky for you, there’s another CREAM location in the Stonestown Galleria. Hours: Monday - Thursday, 12 p.m - 10 p.m. | Friday & Saturday, 12 p.m - 10 p.m. If you find yourself wishing for the olden days of ice cream, this no-frills ice cream shop will satisfy your hunger. Swensen’s, an old fashioned ice cream shop, has been a staple in the Russian Hill neighborhood since 1948. It’s a beautiful shop on the corner with pretty lettering and a neon sign. Don’t panic if you get lost trying to find Swensen’s; it’s tucked away in a residential neighborhood, but if you ask a local, they can certainly point you in the right direction. Swensen’s serves scoops of ice cream that can be placed on a cone and dipped into chocolate. It has classic flavors like toasted almond, cherry bordeaux, cookies ‘n’ cream, banana, and a variety of sherbets. I was pleasantly surprised to see some non-traditional flavors on the menu, too, like cantaloupe and Turkish coffee. Just keep in mind that this ice cream shop has a designated 10-minute parking lot and a register that only accepts cash. Luckily, you’ll only need a five-dollar bill to cover the cost of a single scoop, which is a rarity in this town. 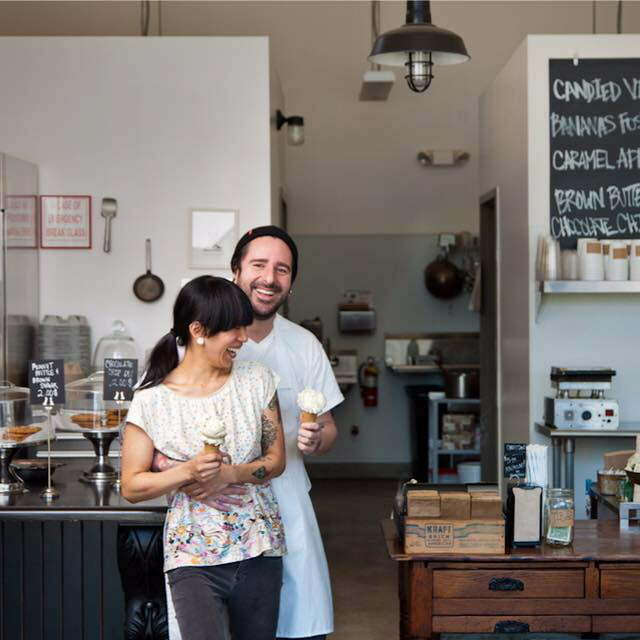 Ice cream enthusiasts can spot this ice cream shop in the Dogpatch neighborhood in a wink. The shop’s huge ice cream mural tempts its passers-by and flags down anyone searching intently for a scoop of something delicious. Just like many ice cream shops in San Francisco, there’s usually a line out the door at Mr. and Mrs. Miscellaneous, even when it’s chilly outside. Mr. and Mrs. Miscellaneous is one of the easier ice cream shops when it comes to parking. It’s also a hop and skip away from the Giants’ ballpark, so if you’re in the neighborhood for a baseball game, here’s a great place to celebrate a win -- or soften the blow of a tragic loss. As far as flavors go, I’d say the pink guava is the most popular. Recently, someone recommended the chicory coffee flavor to me, but as the flavors constantly rotate, there’s no guarantee your favorite flavor will be available each time you visit. However, there’s always a 100% guarantee that you can bite into a delicious, house-made ice cream waffle cone. Address: For a complete list of retailers carrying IT’S-IT Ice Cream Sandwiches, click here. 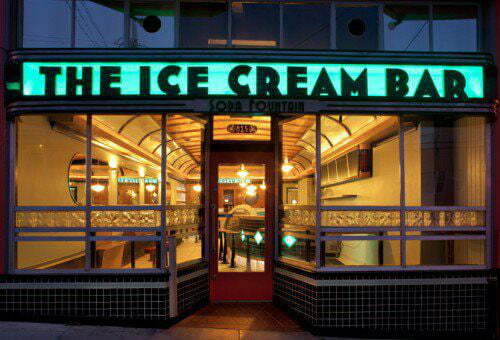 Although IT’S-IT hasn’t had a brick and mortar shop since the 1970s, it would be a crime not to mention their historically delicious ice cream sandwiches on a list of the best ice cream in San Francisco. In fact, this is my absolute favorite ice cream treat. Heck, I sometimes eat an IT’S-IT when I don’t have enough time to eat a real meal, and I rarely feel guilty about it. 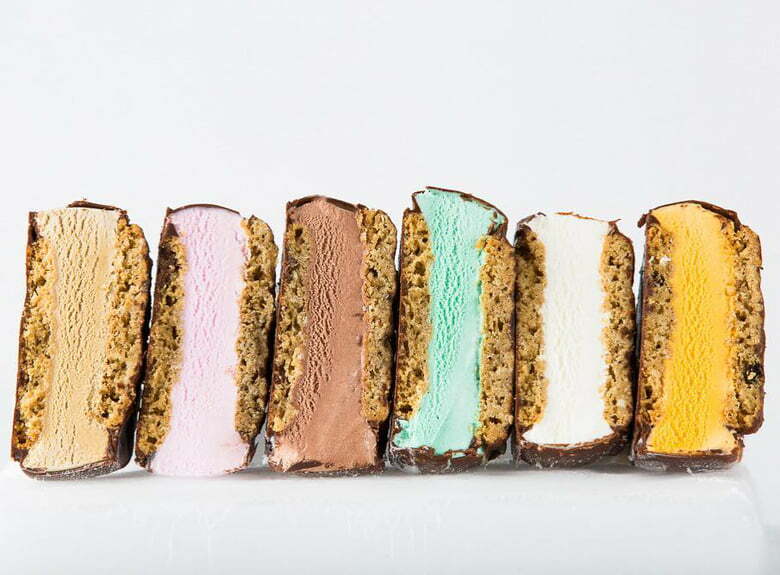 IT’S-IT Ice Cream Sandwiches have been ingrained in San Francisco dessert history since 1928. They started by placing a scoop of vanilla ice cream between two oatmeal cookies, then dipping the entire sandwich in dark chocolate. Taking a bite into an IT’S-IT is pure bliss. Now, IT’S-IT offers way more fun flavors, including chocolate, espresso, strawberry, and mint. I’ve also become a huge fan of two recent releases: pumpkin and green tea. I’d say the mint is the most popular. So, when the lines are too long at your choice of San Francisco ice cream shops, you can conveniently pop into a corner store and find yourself an IT’S-IT! Erin is a San Franciscan cat mom of three who specializes in writing educational content for parents and educators. 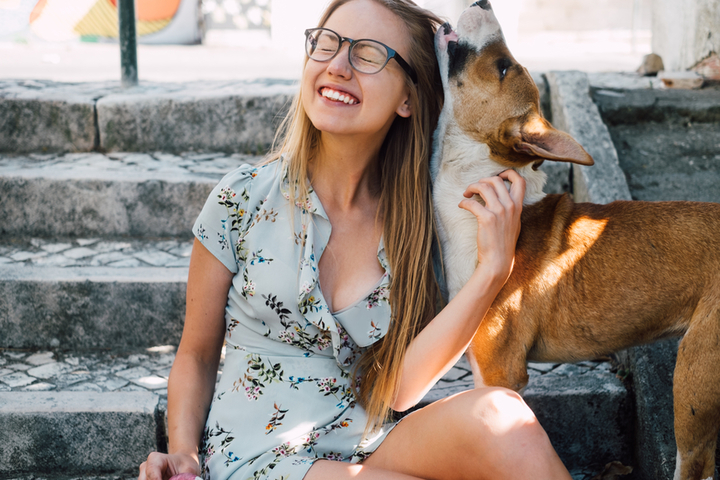 Read her cat blog if you’re into that kind of thing.